Have you ever been reading in the word and a passage stands out to you as if written in bold? The above passage did just that during my reading last week. 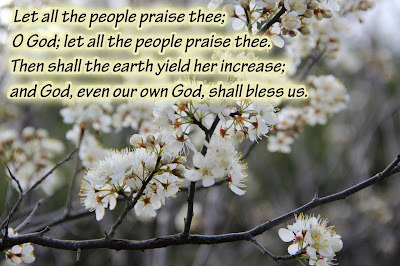 So for this month's Bible study we are going to get to know Psalm 67 and consider the connection between God's blessing and our praise. and cause his face to shine upon us; Selah. If you are like me, you pray every day for God to bless you. The psalmist is praying the same here, but look at the reason he asks for God's blessing: "That thy way may be known upon the earth, thy saving health among all nations." How many times is my motivation for God's favor so His way will be known and His saving health (salvation "by his strips we are healed") throughout the earth? Too few, I'm afraid. Instead, more often my motivation is so I'll be successful, comfortable and satisfied. God can tell the difference and He knows why we are after the blessing. and govern the nations upon earth. Selah. Along with pure motivations in seeking God our readiness to praise Him. Notice the psalmist's reason for praise. It is because of God's righteous judgment and governance. Sisters, too often we only praise the Lord when He blesses us or "does something good in our lives". The truth is God deserves praise not for what He does, but for Who He is. He is righteous. He is sovereign. In a society where those who unveil evil are punished while the baby murderers go free, knowing God will judge righteously is reason alone to rejoice. and God, even our own God, shall bless us. 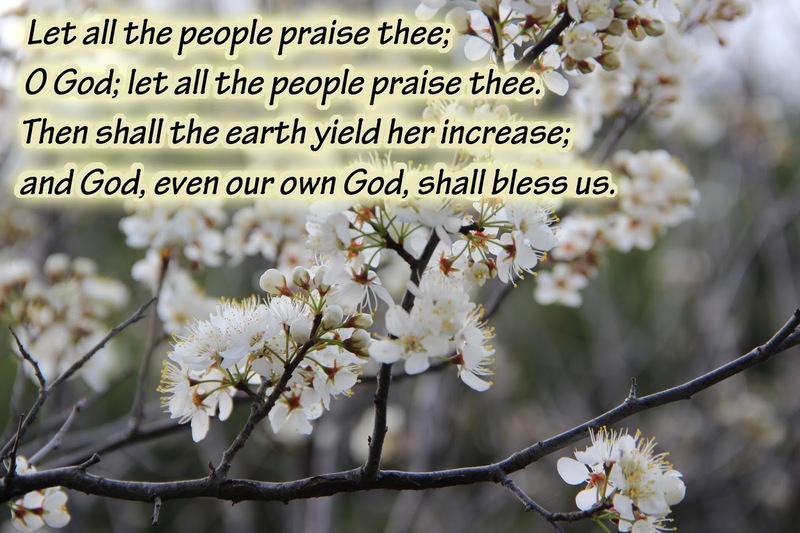 What stood out to me about these two verses is how increase comes after praise. Again, our motivation for praising God is not so He will increase us. However, when our hearts are set on praising God, regardless of circumstances, it appears this praise touches the heart of God. Praise is the fragrance of a heart trusting in the Lord. The Scriptures proclaim "Blessed is the man who trusts in the LORD". If you want to measure your trust, measure your praise. Remember why God brought Israel out of Egypt? It was so all who heard would fear Him. God's blessing has really nothing to do about us, but about Him receiving the glory. So when God does bless us, may we run that blessing ragged using it to exalt the Lord. Would you like to receive all our latest posts and news? Please subscribe below.